Brian Dumoulin played NCAA Division 1 hockey for the Boston College Eagles men's ice hockey team. He was drafted by the Hurricanes in the second round of the 2009 draft but bundled as part of the Brandon Sutter trade to the Penguins for one of the Staal brothers….Jordan, I think. He’s a 6’3”, 220lb defenseman who shoots left. During the 2009 – 2010 season, despite being one of the youngest freshmen in the country, Dumoulin appeared in all 42 games for the national champion Boston College Eagles – scoring 1 goal with 21 assists. Even more impressive was his plus/minus rating of +40. Dumoulin was selected to the Hockey East All-Rookie and Frozen Four All-Tournament teams. Dumoulin was one of the top defensemen in college hockey as a sophomore for Boston College, which captured Hockey East's regular season and playoff championships. He also competed for the bronze-medal winning USA squad at the 2011 World Junior U-20 championships. In his junior season with Boston College, Dumoulin was once again one of the top defensemen in college hockey, managing eight goals, 21 assists, and a plus-27 in 44 games. He was also instrumental in his teams Frozen Four championship, assisting on the game winning goal over Ferris State. 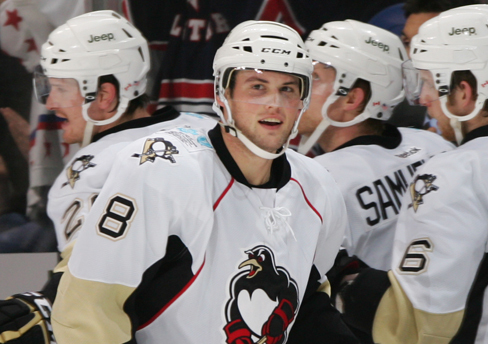 Dumoulin will start the 2012-13 season in the AHL where he will likely play in a second or third pairing. He possesses the strength, size, and balance to keep the front of the net clear of traffic and is also an adept puck-mover with a hard point shot. Long-term, the blueliner projects as a potential top-four defender capable of playing in all situations.